26 March, 2013: Robust and dynamic servo drive technology from Sew-Eurodrive is increasingly replacing traditional asynchronous motors. The servo Spiroplan® gearmotor of the W..CMP series is extremely efficient, quiet and flexible. With the W series servo Spiroplan® right-angle gear unit, Sew-Eurodrive is shifting the focus to simpler applications with a torque range of up to 180 Nm. It is the smallest, most compact and least expensive servo right-angle gear unit series SEW-Eurodrive has ever manufactured. The single-stage Spiroplan® right-angle gear unit is available in models W10, W20, W30, W37 and W47. It can be used as stand-alone gear unit for direct motor mounting or for mounting on the motor using the low backlash adapter. The series is also available in different output versions; either with a shaft and key or with a hollow shaft and a keyway. Both versions are available with a flange-mounted design. When combined with the CMP series of synchronous servomotors, the gear unit acts as a gearmotor. Exceptional precision, dynamics and high torque is offered in this compact version. 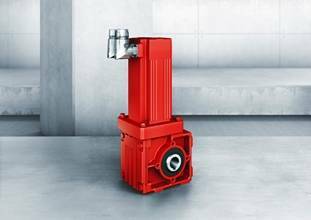 With the servo Spiroplan® right-angle gear unit, Sew-Eurodrive has created a cost-optimised drive solution with consistently low rotational clearance and a continuous positive shaft-hub connection. The wide variety of drive versions provides the user with maximum flexibility and an economic option for their application. Synchronous servo gearmotors are increasingly replacing asynchronous gearmotors, even in simple applications. The high overload capacity and high degree of protection, combined with the low unit volume, make this series an ideal alternative. The servo drive unit’s adjustability, setting range and high dynamic properties make it clear that using servo technology is the right decision. With the W series servo Spiroplan® right-angle gear units, Sew-Eurodrive is shifting the focus to simpler applications with a torque range of up to 180 Nm.